I have experienced a new way of appreciating our awesome world. Under the clouds, but above the trees, the beaches, and the rivers. Flying, like a bird, in an ultralight plane. It was, by far, the most joyful 15 minutes of my entire life. And it was the highlight of my recent Davao City, Compostela Valley, and Davao Oriental tour. My friends and I spent three days in Mati; most of the time on the beach recovering from hangovers gained from attending the Mountaineering Federation of the Philippines’ 39th Annual Climb and Congress held at Aguakan Resort in Maragusan, Compostela Valley. On our second day in Mati, I press-ganged everyone out of their hammocks to accompany me to Mati National Airport so I could add a new entry to the list of things I have done for the first time. For those of you unfamiliar with the world of aviation, ultralights are lightweight, two-seater aircraft. I learned about this activity from AirAsia. A few months back, bloggers from Davao City hosted bloggers Manila, Cebu, and Kuala Lumpur. One of the activities they had arranged was an ultralight flight care of The Mindanao SAGA Flying Club (MSFC). 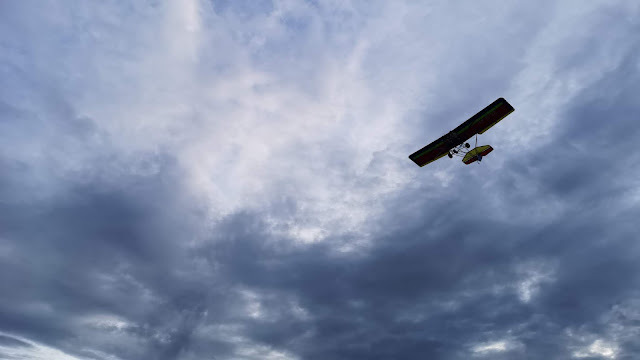 It was already 5:00pm when we reached the airport where we found the ultralight aircraft was ready for takeoff. After signing the waiver (yes, paperwork everywhere these days), paying the fees (P 2,900.00 with videos), we had a quick briefing, and then we were off, up into the blue, to see Mati from above. My pilot’s name was Inaki. He took us off the ground smoothly, and I suddenly felt good when as wind flooded in. Everything felt perfect. I had been expecting to experience moments of terror, moments when I would be unable to suppress my screams, or that my fear of heights would kick-in. But it wasn’t like that at all. Throughout the whole flight I felt only calm. Inaki had told me that standing on top of a building would be scarier. He was right. I don’t know how many times I gushed over the amazing Mati seascape and landscape, running out of superlatives in my mind to adequately describe what I was seeing. As we flew over Dahican Beach I spotted Menzi Resort where we had chosen to camp. I was enthralled to recognize Mt. Hamiguitan from afar, and was reminded of my dream to scale its far-off heights. Inaki also pointed out another of Mati’s popular attractions, the Sleeping Dinosaur and, although it was a long way off our flight path, I had a good view of it. Ultralights have no cabin, they are fully open on all sides, so I had an unhindered view of the ground below. While Inaki flew the aircraft, I spent a lot of time pointing my camera in every direction, trying to preserve this beautiful memory. And, of course, I chatted with Inaki. Around us was a panorama of blues and greens, I remember thinking it was really no wonder. Anyone would choose to settle here. The City of Mati is the capital of Davao Oriental and located just three or four hours away from Davao City. It is home to the popular Dahican Beach, which is a magnet for skimboarders from all over the country. And no wonder! It has a seven-kilometer stretch of white sand beach which is home to several resorts, mostly built for beach camping. During our three-day stay in Mati, we also visited the Subangan Museum, another popular attraction and home to DavOr, the skeleton of a 53-foot male sperm whale. The museum gives visitors the opportunity to appreciate Davao Oriental’s biodiversity and the culture of its indigenous tribe, the Mandayas. I actually didn’t know anything about the Mandayas until I visited Subangan Museum. Of course, we could not leave without taking a closer look at the famous Sleeping Dinosaur. Our original plan had been to trek overland to see it, but, in the end, we chose to just fly a drone fly over and admire it from afar. The drone got a lot closer than I had managed to in the ultralight, and I understood why Mati’s visitors purposely stop on the viewing deck. 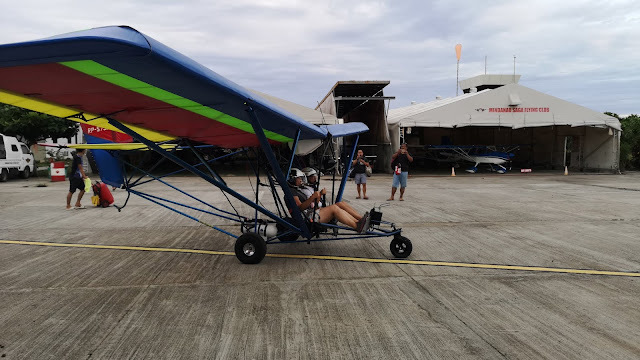 I have to say, of all my Mati experiences, the ultralight flight was the best. And it doesn’t surprise me that it is fast becoming a popular activity this side of Davao Oriental. Though the flight was only 15 minutes, it was enough to deepen my love for Mati, and I really wouldn’t mind coming back and doing some more exploring, not just in the city, but the rest of the province too.